I am lucky enough to have a job where I get and RDO each month and a few weeks ago I took Friday off to go and get the ingredients for my Boat Noodle test cookup. Usually we visit Footscray as a family which I absolutely love but this time I was by myself so I took a bit of time to just enjoy the atmosphere rather than head from place to place as we usually do. I parked in the Footscray market carpark ($1 per hour bargain parking and so much better than a crazy carpark hunt) and scoped out the market for all the ingredients that I needed the next day. I knew that I had a couple of hours until Tina and Charlie met up with me for lunch so I didn't buy any of the meat that I needed. Instead I decided to go to a cafe for a Vietnamese iced coffee, I think it was called Chau something and is near the Leeds St entrance to the Footscray market. Chau is usually frequented by large groups of elderly Vietnamese men who sit outside for hours enjoying coffee and chatting almost themselves. I have to admire these guys, they have such a great community. 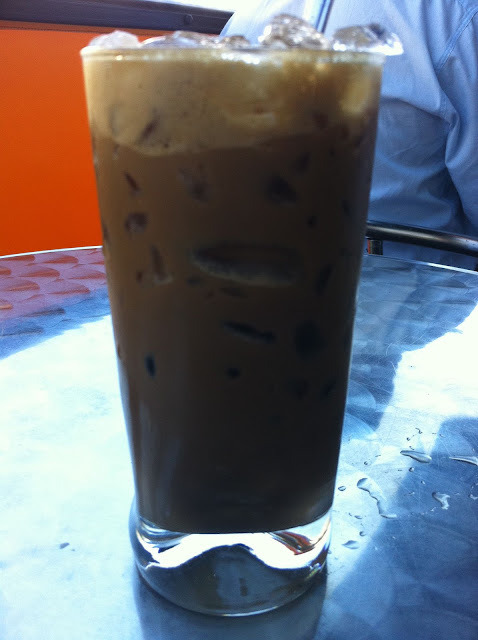 I loved my Vietnamese iced coffee ($3.50) and subtly watched the old Vietnamese guys for tips on how to drink it. I know that seems a strange thing to say that I needed tips on how to drink a coffee but it has a big spoon sticking out of it and is filled with ice so its actually not that easy to drink without looking completely awkward. I was never a big fan of iced coffee (or tea) but I have to say that I am now a definite convert, the addition of the condensed milk really appeals to my sweet tooth! 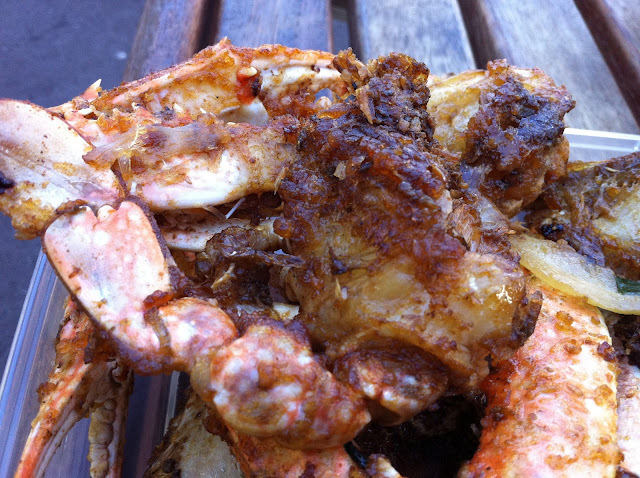 On this particular morning I noticed takeaway containers of fried blue swimmer crab cooked in a sweet sticky looking tamarind sauce. It was only about 10 am but I had to ask about it. 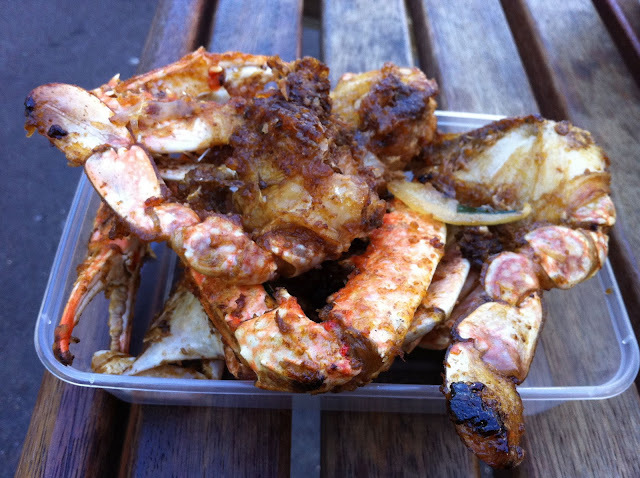 When I was told that they were only $5 for the container I knew that I was soon to be sitting on a park bench in Footscray crunching my way through a container of sticky tamarind fried crab! Of course that's exactly what happened next and I loved every sweet crunchy minute of it! There aren't many places more interesting to sit on a park bench and watch the goings on than in Footscray and I'm pretty sure there's nowhere in Melbourne that you can buy a container of delicious fried crab for $5 to crunch on while you're doing it. Born out of a love of Thai and Vietnamese cuisine, krapow chronicles foodie couple Andy and Tina’s adventures though the culinary wonderland that is Melbourne. Follow krapow and discover Melbourne’s Thai and Vietnamese restaurant scene, learn where to source ingredients to prepare authentic recipes at home and hopefully gain an insight into the interesting culture of both countries along the way.